If you are a lighting designer, architect, urban planner, interior designer, engineer, landscaper or student now is the time to enter your projects into the worldwide LAMP Awards for 2019! Light is a fundamental element of life and a key aspect of all architectural projects. 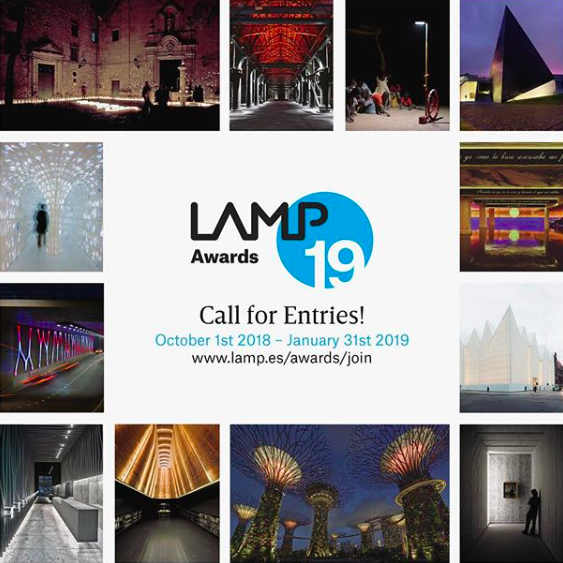 The Lamp Awards, now in its 8th year places great value on the creativity, innovation and sustainability of lighting projects and installations irrespective of the manufacturer/brand of lights installed in projects. - The Outdoor Lighting Award: Awarded for the illumination of façades, monuments, sport facilities, public squares, streets, parks, bridges and tunnels. - The Indoor Lighting Award: Awarded for the illumination of shops, restaurants, hotels, museums, offices and exhibition halls. - The Installation Lighting Award: Awarded for the illumination of both indoor/outdoor spaces that are artistic, social and playful. - The Students Proposals Award: Themed “luminous ambiances within a large scale”, will be awarded to conceptual projects both indoor/outdoor in which light creates atmosphere and luminous ambience. Lighting designers Roger Narboni (France), Uno Lai (Taiwán), Paul Nulty (United Kingdom), Aleksandra Stratimirovic (Sweden) and Pascal Chautard (Chile), together with architects Hilde Léon (Germany) and Antonio Ruiz Barbarin (Spain), and interior designer Mercedes Isasa (Spain) complete the panel of jurors for 2019. Entries close on Thursday the 31st of January 2019, click the link below to register and submit today!